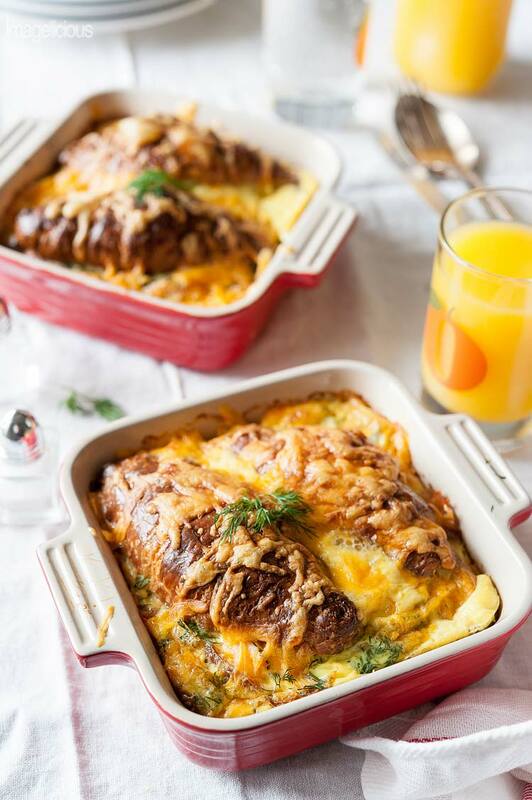 Smoked Salmon Croissant Strata is a perfect brunch dish to make during holidays. Elegant, savoury and a little bit indulgent it’s a sure way to please everyone at the table without breaking a bank. It’s December and it feels like I lost a year. This feeling of loss is so tightly intertwined with joy that I don’t know where one ends and the other begins. I found out I was pregnant just a few days before the end of January and on February 1st my morning sickness started. 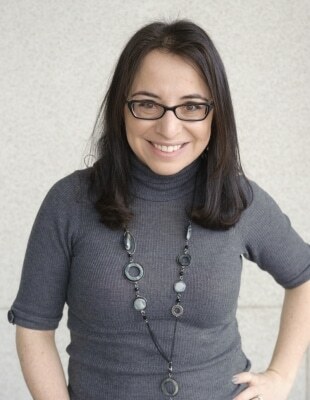 Pregnancy didn’t bring me glowing skin or happiness. I counted the days until it was over and it was way too soon, much sooner than I was prepared for. The following weeks in the hospital and hectic months at home now bring me to December. Ten months have past in a year that I lost, in a year that changed my life. It’s December and as usual I feel nostalgic. I keep thinking about my childhood, my grandparents, and the magic of holidays. I wrote about traditions just over a year ago and I can’t believe how much changed since that post. Now, more than ever, I want to bring rituals into my life. I want to instil the sense of security and stability into my baby’s path. I want her to have traditions that would make her happy and would fill her with a sense of wonder and joy for years to come. For the past seven years that my husband and I have been together, it’s not just the traditional Russian New Year festivities that happen during holidays for me; it’s now filled with Christmas celebrations too. I may not understand Christmas as well as I do New Year, but I love all kinds of celebrations, especially when there are twinkle lights and presents involved. I asked A. many times about his childhood Christmas morning traditions, yet he failed to convey the importance of them. This year, my baby’s first Christmas, I hope to start our own family traditions and that includes a fun and delicious breakfast (even though baby isn’t eating solids yet). 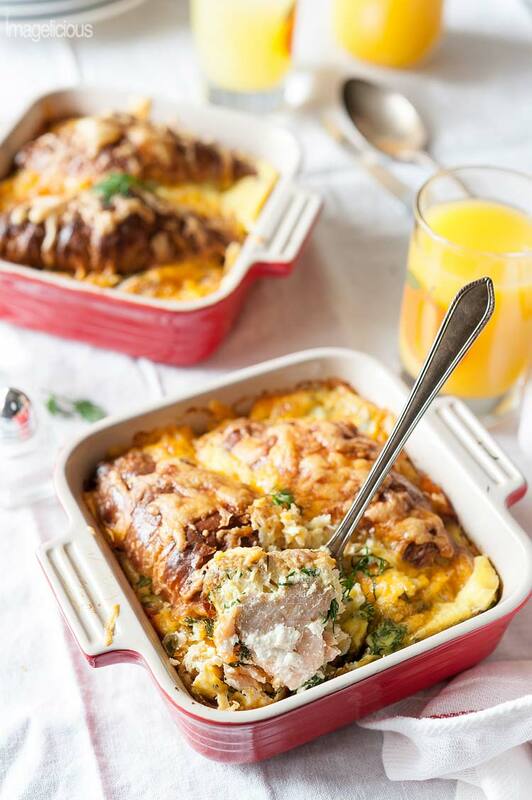 When I host brunches (and I host them often enough), I love making strata or savoury pudding as some know that dish. It’s perfect for the occasion since it needs to be prepared a night before, thus removing the stress of last minute cooking. Even with brunches I follow my 12 tips for easy and stress-free entertaining. I set the table a night before, I make cheese platters and dips, and I prepare a savoury strata. I’ve made many kinds over the years with meats and cheeses and fish and vegetables. I used baguettes, brioches, challas, croissants. All are delicious and all are impressive. But this Smoked Salmon Croissant Strata is my favourite – it looks impressive, it tastes festive, and it’s just a little bit more special than your average ham and cheese dish with the addition of smoked salmon, dill, and capers. 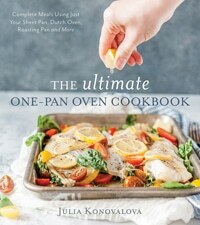 And if you want another amazingly delicious strata recipe, you can find it in my new cookbook (which is a perfect gift for foodies), The Ultimate One-Pan Oven Cookbook. I use smoked salmon in brunch recipes often. or Smoked Salmon and Dill Pancakes with Horseradish sauce. And if you’d like to make your next gathering a little bit special without breaking the bank, then check out my post for 16 Delicious and Budget-Friendly Smoked Salmon Recipes. I measured ingredients for this recipe, but in reality, the only items that should be measured are eggs and milk (and even that I most often than not pour freely). Smoked salmon, dill, capers, and cream cheese could be adjusted to your taste. The idea is that smoked salmon sandwiches are made with cream cheese, salmon and capers, and how much of each ingredient you use is up to you. 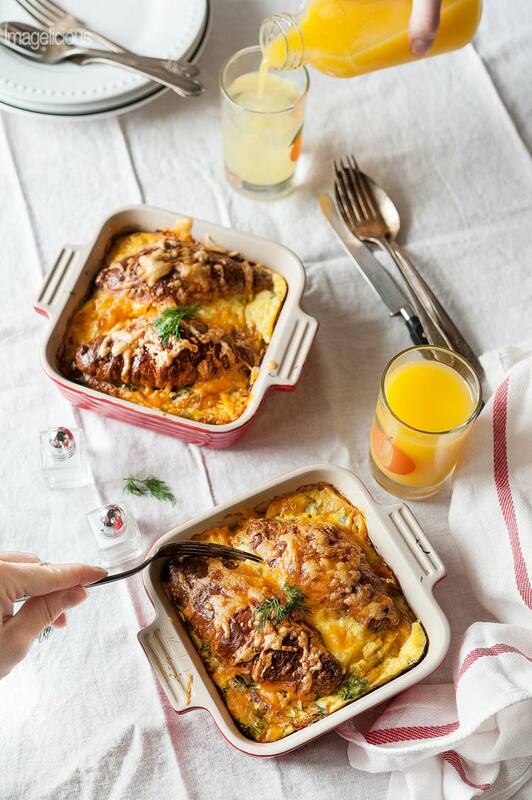 What I like about Smoked Salmon Croissant Strata is that smoked salmon, which is not the cheapest ingredient, can be stretched to make am elegant meal that is still not very expensive. Slice croissants crosswise for sandwiches, place on a parchment lined baking sheet and toast in the oven for about 7-10 minutes until edges just begin to turn golden brown and the croissants are dry. Meanwhile, butter two 5"x5" ovenproof dishes and finely chop capers. Place cooled bottom parts of the croissants into the baking forms, spread cream cheese evenly dividing between all croissants. Add roughly torn smoked salmon to each croissant, sprinkle chopped capers, sprinkle dill all over the croissants and around them. Cover the sandwiches with the top parts of the croissants. In a large bowl whisk together the eggs, mustard and milk until smooth. Add salt and pepper to taste. Pour the milk-egg mixture over the croissants. Tightly cover the baking dishes with plastic wrap and place in the fridge over night (or a minimum of two hours). In the morning, preheat the oven to 350F and take the stratas out of the fridge to come to room temperature. Just before baking sprinkle shredded cheese over each dish. Bake for 30-35 minutes until egg mixture is cooked and firm. I wouldn't really measure cream cheese, smoked salmon, capers, dill, and even cheese when making this. The idea is that you are making smoked salmon sandwiches, so add as much or as little cream cheese and smoked salmon as you'd like. 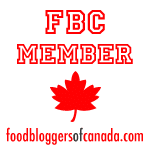 I personally love dill, so I use it a lot especially with fish, but if you are not a fan of dill, then you can use less dill or parsley or omit it all together. 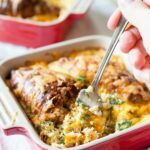 Same with shredded cheese - you want to cover the strata with it, so if you want it to be cheesier, then by all means add a bit more cheddar or for a healthier spin don't add any on top. I used two 5x5" baking dishes, but you can use one larger dish too. If you are using a larger baking form, the cooking time may need to increase a little bit, just make sure that eggs are cooked in the middle of the dish. This sounds like a totally delicious breakfast. I think I would even have it for a light dinner. Perfect for entertaining and to feed a crowd too. 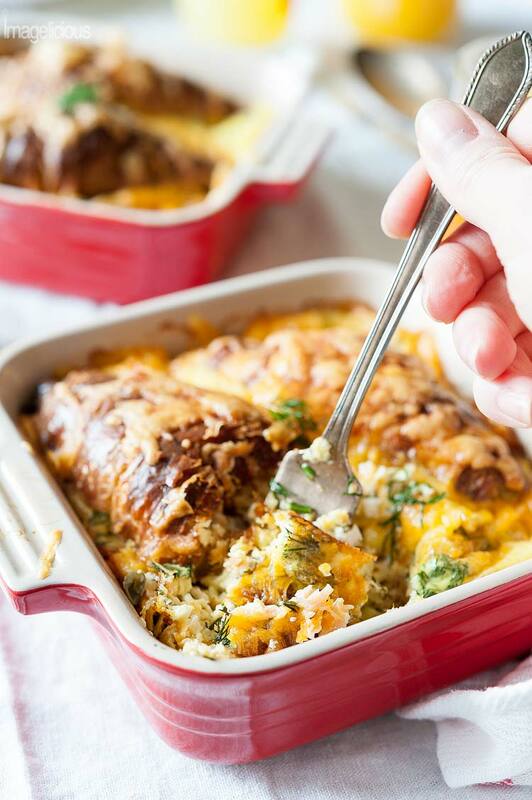 I love making strata when I’m entertaining – saves so much time! Oh this sounds so delicious Julia. I love your stress free tips. This looks perfect for hosting a brunch. Have not heard the word strata for a long long time. Sounds so exotic, we must use it often. he he.. Thanks for the recipe. Thank you, Veena! I follow my stress free tips all the time. My friends always ask me how I entertain without difficulties and that’s because of those tips. When they come in I usually don’t even have to do any finishing touches as everything is ready, in the oven and cleaned up. Definitely trying this out for brunch soon! I love the idea of croissants in the casserole! I hope you like it! And you don’t have to use smoked salmon if you don’t like it – ham and cheese would work as well.